It takes a certain type of climate to cultivate healthy, godly reactions to differences, disagreements, and wrongs. We can learn how to build the kind of environment to prevent conflict by looking at the “one-another” commands of Scripture. They’re listed below to show how it takes not just the right kinds of words but also actions, and at the very core, the right attitudes to prevent conflict. Such commitment, patience, and humility toward one another will lead to the kind of reactions that diffuse conflict rather than fuel it. It provides an environment in which people can disagree or make mistakes and know they still belong. Getting along with one another doesn’t mean we overlook wrongs or ignore difficult subjects. Sometimes we must deal with hard issues. But, truthful communication combines with grace and mercy to build up rather than tear down. In this kind of environment people can open up, express their doubts, and even confess their sins to one another, without feeling like they will be verbally attacked or condemned. 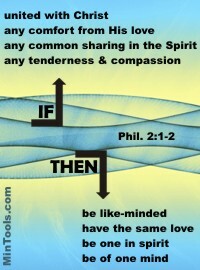 We tend to be more cooperative and compromising in an atmosphere of love and understanding. In this kind of culture we “do nothing out of selfish ambition or vain conceit. Rather, in humility value others above yourselves, not looking to your own interests but each of you to the interests of the others” (Phil. 2:1-4). Leaders: Work at building an environment of true Body Life. Make living out the one-another commands of Scripture part of your church culture. Of course, that begins with leadership setting the example as well as teaching. We must acknowledge, however, that even in churches that actively work at these “one-another” commands, conflict will come. The next post will consider why and how Body Life not only helps prevent conflict but also resolve it. never saw one anothers categorized this way.interesting. Hello Sammy. This post isn’t necessarily intended to categorize the “one-another” commands but rather to show a basic idea of how they relate to attitudes, words, and actions that can prevent conflict. To be sure, there would be much overlap as many of the “one-anothers” listed under one area in the post could be listed in others.